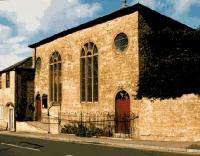 Beaminster Museum is a local history museum covering Beaminster and the surrounding villages. Its collection covers past local families of importance, which includes the Hine family who formed the Hine Cognac Dynasty; past local trades and schools; a fine collection of agricultural tools and a working church turret clock. There is a reference section, which contains books local to the area, as well as a collection of local videos and CDs. The museum is housed in a converted Congregational Church, which still has its early 19th century organ. The building also includes a Meeting Room and kitchen, which is available for hire. The old Congregational Chapel was built in 1749 and enlarged in 1825. It is a charming building (Grade II listed), important architecturally to the town, being surrounded by fine 17th century and 18th century houses which survived the three great fires which devastated other parts. For 250 years the church served not only Beaminster, but some of the neighbouring villages; it has been supported in the past by leading families of the locality - families such as the Daniels, one of whom fought for Monmouth, and the Hines, who founded the Hine Cognac dynasty. These families were closely associated with the chapel, as the visitor will be able to discover. The building was acquired in 1990 by the Beaminster Museum Trust, a registered charity set up to found and maintain a museum for the town of Beaminster and the surrounding rural area. Ground floor displays illustrate the life of the people of Beaminster from medieval to modern times: buildings, families, trades, crafts, pastimes and social events. With the help of an illuminated map you can discover for yourself the major historic buildings of the town. A facsimile of the Doomsday book (1086) confirms the age of the settlement, while new panels show something of what went on here in the second world war of the century just past. The Gallery houses displays showing the archaeology and agriculture of the area. The former chapel can best be seen from this floor, where history is displayed, and the fine example of an early 19th century organ, with its original gilding, can be viewed and even heard. The almost 200 year old Turret Clock from St. Andrews Church Burstock has been brought back to working condition, and is now on display. Wind it yourself and see what makes it tick!